Stoneware is a rather broad term for pottery or other ceramics fired at a relatively high temperature. A modern technical definition is a vitreous or semi-vitreous ceramic made primarily from stoneware clay or non-refractory fire clay. Whether vitrified or not, it is nonporous (does not soak up liquids); it may or may not be glazed. Historically, across the world, it has been developed after earthenware and before porcelain, and has often been used for high-quality as well as utilitarian wares. As a rough guide, modern earthenwares are normally fired in a kiln at temperatures in the range of about 1,000°C (1,830 °F) to 1,200 °C (2,190 °F); stonewares at between about 1,100 °C (2,010 °F) to 1,300 °C (2,370 °F); and porcelains at between about 1,200 °C (2,190 °F) to 1,400 °C (2,550 °F). Historically, reaching high temperatures was a long-lasting challenge, and temperatures somewhat below these were used for a long time. Earthenware can be fired effectively as low as 600°C, achievable in primitive pit firing, but 800 °C (1,470 °F) to 1,100 °C (2,010 °F) was more typical. Stoneware also needs certain types of clays, more specific than those able to make earthenware, but can be made from a much wider range than porcelain. Stoneware, which, though dense, impermeable and hard enough to resist scratching by a steel point, differs from porcelain because it is more opaque, and normally only partially vitrified. It may be vitreous or semi-vitreous. It is usually coloured grey or brownish because of impurities in the clay used for its manufacture, and is normally glazed. Traditional stoneware – a dense and inexpensive body. It is opaque, can be of any colour and breaks with a conchoidal or stony fracture. Traditionally made of fine-grained secondary, plastic clays which can be used to shape very large pieces. Fine stoneware – made from more carefully selected, prepared, and blended raw materials. It is used to produce tableware and art ware. Chemical stoneware – used in the chemical industry, and when resistance to chemical attack is needed. Purer raw materials are used than for other stoneware bodies. Ali Baba is a popular name for a large chemical stoneware jars of up to 5,000 litres capacity used to store acids. Thermal shock resistant stoneware – has additions of certain materials to enhance the thermal shock resistance of the fired body. Electrical stoneware – historically used for electrical insulators, although it has been replaced by electrical porcelain. Formulations for stoneware vary considerably, although the vast majority will conform to: plastic fire clays, 0 to 100 percent; ball clays, 0 to 15 percent; quartz, 0 to 30 percent; feldspar and chamotte, 0 to 15 percent. Stoneware can be once-fired or twice-fired. Maximum firing temperatures can vary significantly, from 1100 °C to 1300 °C depending on the flux content. Typically, temperatures will be between 1180 °C and 1280 °C, the higher end of which equate to Bullers Rings 38 to 40 or Seger cones 4 to 8. To produce a better quality fired glaze finish, twice-firing can be used. This can be especially important for formulations composed of highly carbonaceous clays. For these, biscuit firing is around 900 °C, and glost firing (the firing used to form the glaze over the ware) 1180–1280 °C. Water absorption of stoneware products is less than 1 percent. Another type, Flintless Stoneware, has also been identified. It is defined in the UK Pottery (Health and Welfare) Special Regulations of 1950 as: "Stoneware, the body of which consists of natural clay to which no flint or quartz or other form of free silica has been added." 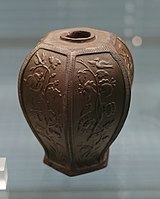 Traditional East Asian thinking classifies pottery only into "low-fired" and "high-fired" wares, equating to earthenware and porcelain, without the intermediate European class of stoneware, and the many local types of stoneware were mostly classed as porcelain, though often not white and translucent. Methods of forming stoneware bodies include moulding, slipcasting and wheel throwing. Underglaze and overglaze decoration of many types can be used. Much tableware in stoneware is white-glazed and decorated, and it is then visually highly similar to porcelain or faience earthenware. Chinese Yixing teapot, Qing dynasty, c. 1765-1835, with painted slip. The Indus Valley Civilization produced stoneware, with an industry of a nearly industrial-scale mass-production of stoneware bangles throughout the civilization's Mature Period (2600–1900 BC). Early examples of stoneware have been found in China, naturally as an extension of higher temperatures achieved from early development of reduction firing, with large quantities produced from the Han dynasty onwards. 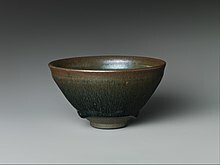 In both medieval China and Japan, stoneware was very common, and several types became admired for their simple forms and subtle glaze effects. Japan did not make porcelain until about 1600, and north China (in contrast to the south) lacks the appropriate kaolin-rich clays for porcelain on a strict Western definition. Jian ware in the Song dynasty was mostly used for tea wares, and appealed to Buddhist monks. Most Longquan celadon, a very important ware in medieval China, was stoneware. Ding ware comes very close to porcelain, and even modern Western sources are notably divided as to how to describe it, although it is not translucent and the body often grey rather than white. In China, fine pottery was very largely porcelain by the Ming dynasty, and stoneware mostly restricted to utilitarian wares, and those for the poor. Exceptions to this include the unglazed Yixing clay teapot, made from a clay believed to suit tea especially well, and Shiwan ware, used for popular figures and architectural sculpture. But in Japan many traditional types of stoneware, for example Oribe ware and Shino ware, were preferred for chawan cups for the Japanese tea ceremony, and have been valued up to the present for this and other uses. From a combination of philosophical and nationalist reasons, the primitive or folk art aesthetic qualities of many Japanese village traditions, originally mostly made by farmers in slack periods in the agricultural calendar, have retained considerable prestige. Influential tea masters praised the rough, spontaneous, wabi-sabi, appearance of Japanese rural wares, mostly stoneware, over the perfection of Chinese-inspired porcelain made by highly-skilled specialists. Stoneware was also produced in Korean pottery, from at least the 5th century, and much of the finest Korean pottery might be so classified; as in China, the border with porcelain is rather fuzzy. Not only celadons but much underglaze blue and white pottery can be called stoneware. Thailand manufactured stoneware in two principal kiln centres, Si Satchanalai and Sukhothai. The firing technology used in Thailand seems to have come from China. In contrast to Asia, stoneware could be produced in Europe only from the late Middle Ages, as European kilns were less efficient, and the right sorts of clay less common. Some ancient Roman pottery had approached being stoneware, but not as a consistent type of ware. Medieval stoneware remained a much-exported speciality of Germany, especially along the Rhine, until the Renaissance or later, typically used for large jugs, jars and beer-mugs. "Proto-stoneware", such as Pingsdorf ware, and then "near-stoneware" was developed there by 1250, and fully vitrified wares were being produced on a large scale by 1325. The salt-glazed style that became typical was not perfected until the late 15th century. England was to become the most inventive and important European maker of fancy stoneware in the 18th and 19th centuries, but there is no clear evidence for native production before the mid-17th century. German imports were common from the early 16th century at least, and known as "Cologne ware" after the centre of shipping it, rather than making it. Some German potters were probably making it in London in the 1640s, and a father and son Wooltus (or Woolters) were doing so in Southampton in the 1660s. Many modern commercial glazed tablewares and kitchenwares use stoneware rather than porcelain or bone china, and it is common in craft and studio pottery. 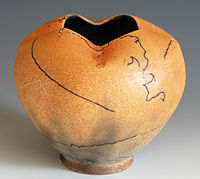 The popular Japanese-inspired raku ware is normally stoneware. Bartmann jug – A decorated stoneware form that was manufactured in Europe throughout the 16th and 17th centuries, especially in the Cologne region of Germany. Redware - unglazed stoneware with a terracotta red, initially imitating Chinese Yixing ware teapots. Mostly c. 1680-1750. The Dutch-German Elers brothers brought it to Staffordshire in the 1690s. Böttger Ware – A dark red stoneware developed by Johann Friedrich Böttger by 1710, a superior form of redware. It is a very significant stage in the development of porcelain in Europe. Cane Ware – An eighteenth-century English stoneware of a light brownish-yellow colour (like bamboo), developed by Josiah Wedgwood in the 1770s. During the 19th and the earlier part of the 20th century, cane ware continued to be made in South Derbyshire and the Burton-on-Trent area as kitchen-ware and sanitary-ware. It had a fine-textured cane-coloured body with a white engobe on the inner surface often referred to as cane and white. Crouch Ware, now often just called Staffordshire salt-glazed stoneware. Light-coloured, developed in 1696 in Burslem, according to Simeon Shaw. It is one of the earliest types of stoneware made in England. The origin of the name has been disputed: on one theory, the ingredients included a clay from Crich, Derbyshire, the word "crouch" being a corruption. On another, it comes from Creussen near Bayreuth in Bavaria, whose type of tall cruche jugs were called "crouch" when imported to England. Jasperware - Another Wedgwood development, using tinted clay bodies in contrasting colours, unglazed. Rosso Antico – A red, unglazed stoneware made in England during the 18th century by Josiah Wedgwood. It was a refinement of the redware previously made in North Staffordshire by the Elers brothers. Coade stone – A type of artificial stone moulded into sculptures and architectural details, imitating marble. Developed in England around 1770. 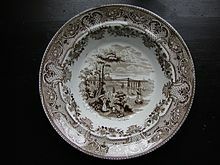 Ironstone china - patented in 1813, often classed as earthenware, but very strong and vitreous, and popular for wares with heavy usage. American stoneware was the predominant houseware of 19th century North America, where the alternatives were less developed. ^ "Tea Bowl with "Hare's-Fur" Glaze". Metropolitan Museum of Art. 2012-11-30. Retrieved 2013-02-19. ^ a b Arthur Dodd & David Murfin. Dictionary of Ceramics; 3rd edition. The Institute of Minerals, 1994. ^ Though "normally glazed" is not true for many historical and modern examples. ^ a b c Dictionary Of Ceramics. Arthur Dodd & David Murfin. 3rd edition. The Institute Of Minerals. 1994. 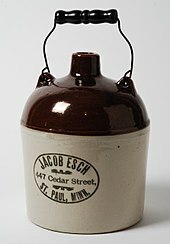 ^ "Red Wing bailed jug with Jacob Esch advertisement". MNHS Collections. ^ Cuff, Yvonne Hutchinson. Ceramic Technology for Potters and Sculptors. London: A.&C. Black, 1994, p. 64. ^ Cripss, J.C.; Reeves, G.M. ; and Sims, I. Clay Materials Used in Construction. London: The Geological Society, 2006, p. 408. ^ Rhodes, Daniel and Hopper, Robin. Clay and Glazes for the Potter. Iola, Wisc. : Krause Publications, 2000, p. 109. ^ Arthur Dodd & David Murfin. Dictionary of Ceramics; 3rd edition. The Institute Of Minerals, 1994. ^ Mark Kenoyer, Jonathan (1998). Ancient Cities of the Indus Valley Civilization. Oxford University Press. p. 260. ^ Satyawadi, Sudha (July 1, 1994). Proto-Historic Pottery of Indus Valley Civilization; Study of Painted Motif. D.K. Printworld. p. 324. ISBN 978-8124600306. ^ Blackman et all (1992). The Production and Distribution of Stoneware Bangles at Mohenjo-daro and Harappa as Monitored by Chemical Characterization Studies. Madison, WI, USA: Prehistory Press. pp. 37–44. ^ Sato, Masahiko. Chinese Ceramics: A Short History (1st edition). John Weatherhill, Inc. (1981), p.15. ^ Li, He. Chinese Ceramics: A New Comprehensive Survey. Rizzoli International Publications, Inc. New York, New York (1996), p. 39. ^ Rhodes, Daniel. Stoneware and Porcelain: The Art of High-Fired Pottery. Chilton Co., Philadelphia, Pennsylvania (1959), pp. 7 - 8. ^ "Pottery". www.wangdermpalace.org. Retrieved 2018-10-09. ^ "WedgwoodŽ Official UK Site: Wedgwood China, Fine China Tableware and Gifting". Wedgwood.com. Archived from the original on 2010-08-03. Retrieved 2012-04-26. ^ "Cane Ware". Wedgwoodsocalif.org. 2012-01-23. Retrieved 2012-04-26. 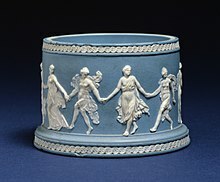 ^ "Wedgwood Official UK Site: Wedgwood". Wedgwood.com. Archived from the original on 2011-01-20. Retrieved 2012-04-26. ^ Wedgwood and his imitators. N.H.Moore. Frederick A. Stokes Company, 1909. Beardman jugs from the Avondster site—Provides photographs and history of early Rhenish stoneware vessels, produced circa 16th-century-18th century.